I loved Strawberry Shortcake when I was growing up. I loved the way my little doll smelled and I even had a Strawberry Shortcake motorized bike when I was in the 5th grade. It went about 3 mph, but man I loved it! So to see the whole gang coming back for this generation, I’m so geeked! I had the pleasure of throwing a 4th birthday party for a friend’s daughter who loves Strawberry Shortcake and her friends. But in wanting to do something a little different, we decided to put one of the friends in the spotlight and threw an Orange Blossom party! She is described as Strawberry Shortcake’s main friend. 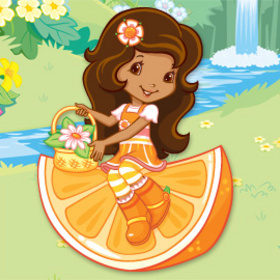 Cartoonito says that Orange Blossom always solves any problem with a smile and loves being helpful. She runs Berry Bitty City’s town market, Orange Mart, which has everything you could need! So, to the party! Wanna see some pics? Yes? Yay! I just love those sunflowers…they make me smile. For all of the food labels, I edited a printables set from BellaGrey Designs, customizing it to the menu. I used the cupcake toppers to make the medallion on the straws by simply punching holes opposite to each other and sliding them onto the straws. For the water bottle labels, I used an image of Orange Blossom herself (not part of the printables set) and the same graphics for the cupcake toppers. After the kids ate, we went and played a few games. I found a list of Strawberry Shortcake themed games here. I improvised them a little to accomodate my age group and their energy levels. The kids were able to “pick” their oranges from the tree for one of those games. I had the kids move their orange from the starting line to the finish. Without using their hands or feet. It was hilarious…scooting and laughing everywhere! Of course, the one boy at the party came from out of nowhere and beat everyone. He earned himself first dibs on the dessert table, after the birthday girl of course! For the gift baskets, I used berry boxes that I found over at Think Garnish and embellished them with an orange bearing the child’s name and green ribbon. I filled them with an orange, a bag of candy, crayons, and notepads, bubbles, or silly string; for the seals on the candy bag, I printed the cupcake toppers onto sticker sheets. The birthday girl was so excited! She was so happy that she sat with me during that entire church service the next day <3 I’d say that shindig was 4 year old approved! Happy birthday darling Kelsey! The next time I style this party, I’m totally going to have to make one of these super cool piñatas that are found over on the Shari’s Berries blog! For the Orange Blossom party, I’d have to make the donut one into a jumbo orange slice! Click on the image for the quick and easy tutorial! Styling, Photography, and Sugar Cookies by Creating Awesomenessity! SO CUTE! i love all the details & the color combo! What an adorable party and I love the colors perfect combinations. I like that you did the party this way. Every detail is fun! Great Job wish I had been on the guest list. Thank you Susan! I’m glad that it all came together successfully 🙂 It was a lot of fun to do! Adorable! I love all the details and that game is hilarious! So much fun. I can see all the love you put in this party. Love it all! Adorable! I love all the details and that game is hilarious! I can see all the love you put into this party, love it all!